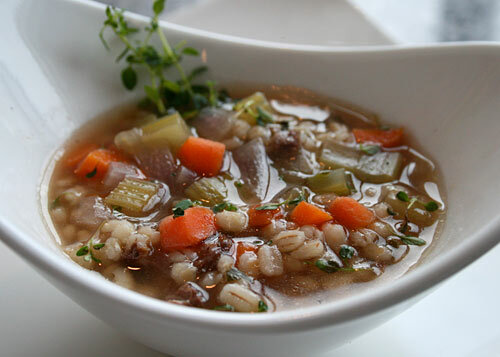 A hearty rich soup, perfect for those cooler days. Add some crusty Italian bread, a crisp green mixed salad and some fruit for dessert to create a complete meal. To vary this soup, you can add two cups of chopped canned tomatoes for two cups of the beef broth. This soup freezes well so consider making a double batch and freezing half in individual serving sized containers. It really is worth the effort to make your own beef broth for this soup. To make things a little easier, make the broth ahead of time and freeze it. Barley is a wonderfully versatile cereal grain with a rich nutlike flavor and an appealing chewy, pasta-like consistency. Barley is a high fiber grain that helps to lower cholesterol as well as provides food for the friendly bacteria in the intestines. Carrots are high in beta carotene and antioxidants. A traditional favorite family recipe. Homemade beef stock makes all the difference in this soup. Heat the broth and add the carrots, onions, celery and the barley. Cook for about 25 to 35 minutes or until the barley is tender. Add the reserved pieces of beef, chopped into small pieces, and chopped parsley. Serve hot, topped with a little drizzle of olive oil and grated cheese.